The drug has immunoregulatory, detoxification, hepatoprotective action and causes inactivation of free radical and peroxide compounds. Pharmacological action is based on the achievement of three main effects: correction of the immune system, restoring the balance of the oxidative-antioxidant reaction of the body and inhibition of multidrug resistance mediated by proteins of the transmembrane cell transport pump. The action of the drug begins to develop within 2-3 hours (fast phase) and lasts up to 4 months (medium and slow phases). 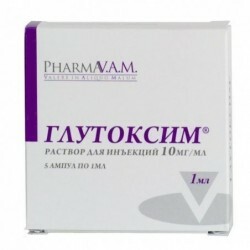 During the fast phase (duration - up to 2-3 days), the detoxification effect is manifested primarily - the antioxidant defense of the body is enhanced by stimulating the production of ceruloplasmin, lactoferrin, catalase activity; the drug normalizes lipid peroxidation, inhibits the breakdown of cell membrane phospholipids and the synthesis of arachidonic acid, followed by a decrease in blood cholesterol and production of inflammatory mediators. 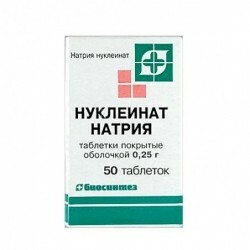 In case of toxic and infectious liver damage, the drug prevents cytolysis, reduces the activity of transaminases (AST, ALT) and serum bilirubin content. During the middle phase (it starts in 2-3 days, the duration is up to 7-10 days), the reactions of phagocytosis and the death of intracellular bacteria and viruses increase. 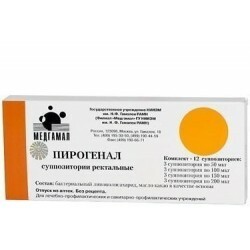 During the slow phase (it begins to develop at 7-10 days, duration up to 4 months), Immunofan's immunoregulatory effect is manifested - restoration of impaired indicators of cellular and humoral immunity. During this period, normalization of the immuno-regulatory index is observed, an increase in the production of specific antiviral and antibacterial antibodies is observed equivalent to the action of some therapeutic vaccines. Unlike the latter, the drug does not significantly affect the production of reagin antibodies of the IgE class and does not enhance the immediate-type hypersensitivity reaction; Imunofan stimulates the formation of IgA in its congenital insufficiency. Imunofan effectively suppresses the multidrug resistance of tumor cells and increases their sensitivity to the action of cytostatic drugs. Chronic inflammatory diseases of various etiologies. When using the bottle should be held vertically, spray up. Remove protective cap from sprayer. Before the first use, fill the dosing pump by pressing on the wide rim of the sprayer 3-4 times. Insert the nebulizer into the nasal passage with the head upright. Press the wide rim of the spray gun once to stop. 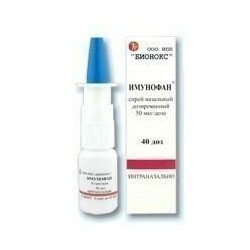 In 1 dose of the drug contains 50 μg of imunofan. The daily dose should not exceed 200 mg. Assign 1 dose (50 μg) in each nasal passage 2 times a day, daily for 10-15 days. 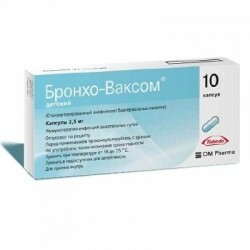 On 1 dose (50 mkg) in each nasal course 2 times a day, every day, the course of treatment is 10-15 days. If necessary, the course can be repeated in 2-4 weeks. 1 dose (50 mcg) in each nasal passage 1 time a day, every day, a course of treatment 10-15 days, to prevent relapse, repeat courses should be conducted after 4-6 months. On 1 dose (50 mkg) in each nasal course 1 time a day, every day, for 10-15 days. If necessary, the course can be repeated in 2-4 weeks. On 1 dose (50 mkg) in each nasal course 1 time a day, every day, for 8-10 days. If necessary, and the presence of pronounced effects of toxicosis, it is recommended to repeat the course. 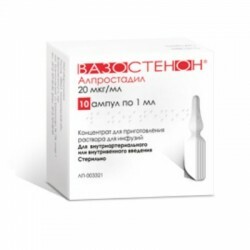 Increases the effectiveness of other types of drug therapy: the use of Imunofan helps to overcome the resistance to glucocorticosteroid therapy. The purpose of the drug is possible in combination with anti-inflammatory steroid and nonsteroidal anti-inflammatory drugs. Due to insufficient knowledge, caution should be used during pregnancy and lactation. As a result of the activation of phagocytosis, a short-term exacerbation of the foci of chronic inflammation, supported by the persistence of viral or bacterial antigens, is possible. 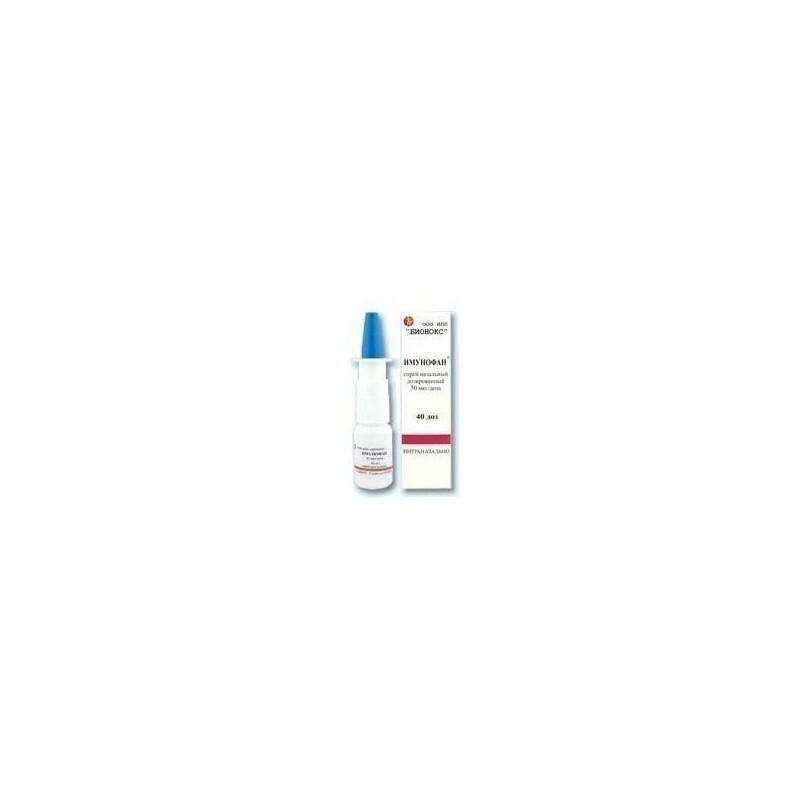 Dosage form: Dosed nasal sprayclear, or slightly pale, colorless, or slightly yellowish liquid. A slight peculiar smell is allowed.